Skip the sign-up sheet and the long waits. Count 24 samples with trypan blue staining in 48 seconds. When imaging and analyzing with fluorescent viability dyes 24 samples are completed in 2.5 minutes. 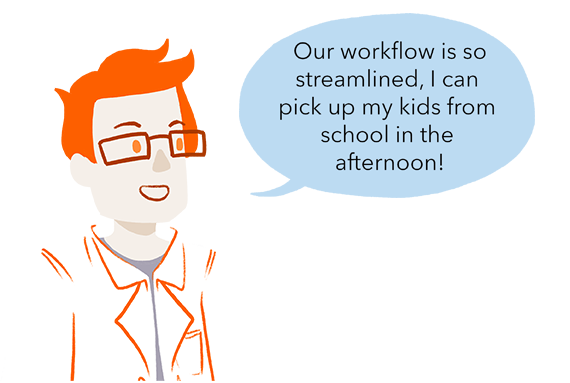 Get all those all-day, multi-scientist experiments done in 1.5 hours with one pair of hands. Analyze low-volume primary cell samples. 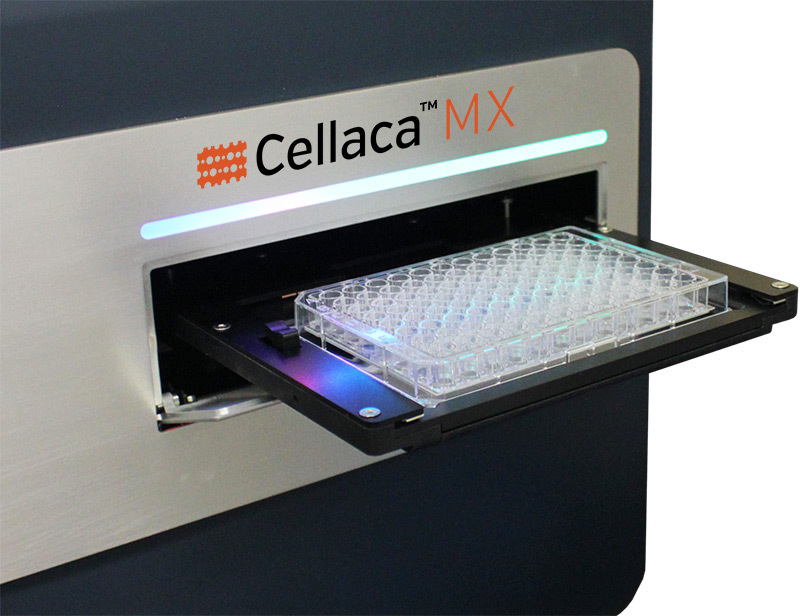 Cellaca MX only needs 25 μL of cells, so you can analyze tumor biopsy tissue, mouse splenocytes, tumor infiltrating lymphocytes (TILs) and more. Human PBMC sample stained with Acridine Orange/Propidium iodide (AO/PI) and imaged using brightfield and fluorescence on Cellaca MX. Count only the cells you’re looking for. Use brightfield to check viability. Use fluorescence when you need specific details on cell health – tissue debris and red blood cells won’t artificially change your count. Brightfield and fluorescent images of PBMCs. In brightfield, white blood cells, platelets, and red blood cells are seen. 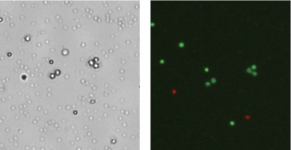 Nuclear fluorescent staining using both green and red channels accurately identifies only the white blood cells. Cellaca MX results are highly reproducible and linear across a 2-log cell concentration range. You’ll also get consistent counts across systems, labs and users. That means you can run a sample once and know you’ve got the right result the first time. 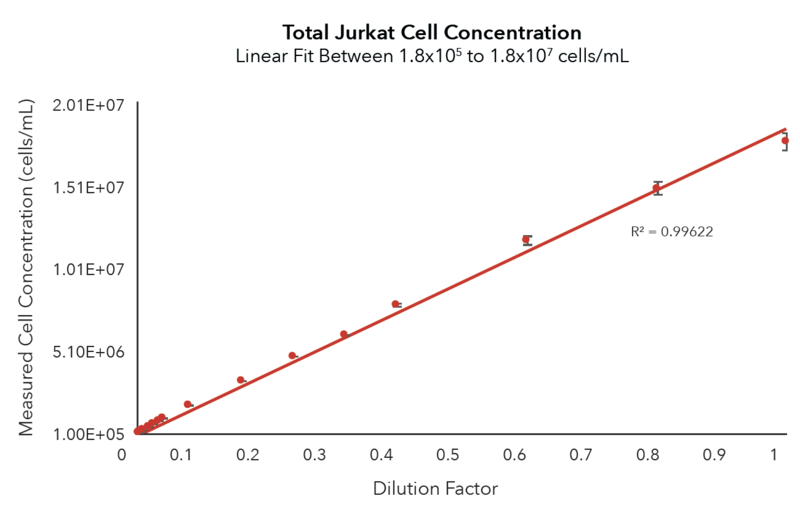 Serial dilution of Jurkat cells from 1.8E+07 to 1.8E+05 cells/mL analyzed on Cellaca MX. 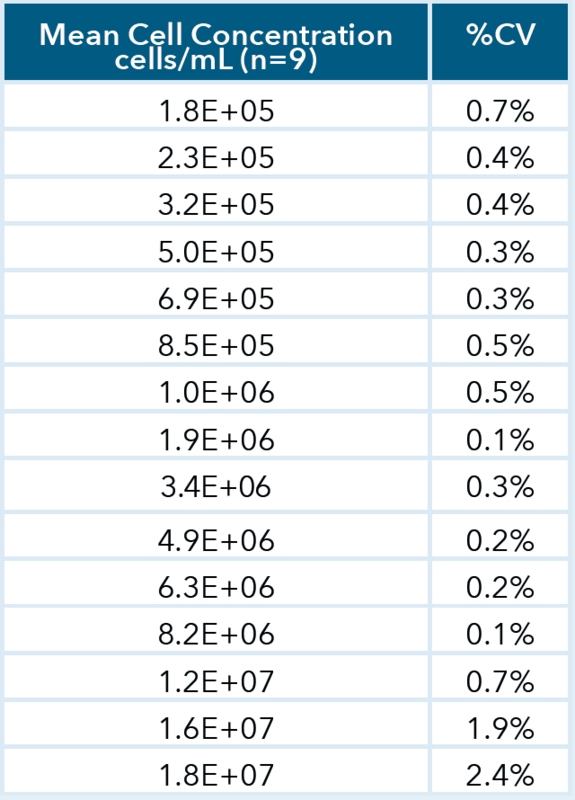 Counts were linear across the entire concentration range with CVs <2.4% for mean cell concentrations of 1.6E+07 cells/mL or higher, and <0.7% for 1.2E+07 cells/mL and below (n=9). 50 animals, 150 samples, all counted in 1.5 hours!